On Tuesday night I had a lovely night out with a friend. She very kindly invited me up to her stables to have a shot with her new horse. Quasar is a beautiful beast, he is dapple grey and pretty tall – I would say around 15h. 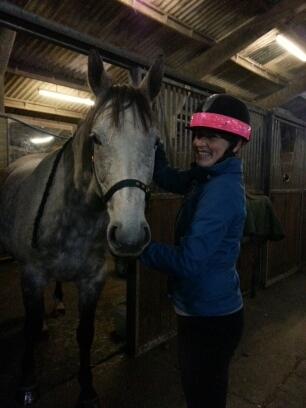 She has him on loan until May and is working to get him a little fitter, especially for the Spring – she loves hacking. I used him in the indoor school last night, it is a small-ish school (which secretly I am always pleased about as I didn’t have to canter him) but a good size for me to get to know Quasar. It is always interesting riding a privately owned horse as opposed to the riding school ponies. He was really spritely to me, even though my mate kept referring to him as a donkey 🙂 I did find it slightly difficult to think of what to do with him when left to my own devices. I did some circles, transitions, a bit of leg yielding and tried to focus a little on keeping my position correct to help him. I had so much fun it was ridiculous. 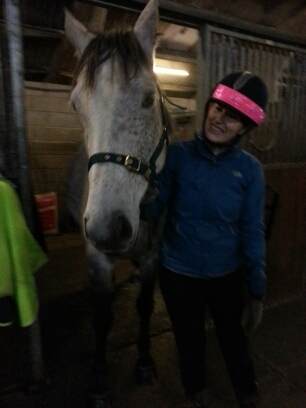 I couldn’t believe how sensitive he was in some ways, the moment I applied my inside leg he willingly moved to the outside track – my main difficulty was in keeping him in trot! Quasar – what a cutie! I am hoping that I will be able to pop up after work on a more regular basis to get to know him a little better. I also now have plans and have been digging out my dressage tests from last year, I think a warm up then a dressage test and then some exercises like serpentines and figures of eight would be really good. Of course this all depends on my mate letting me ride him again! A little bit of a poser? Another positive was that while my nerves sometimes appeared I could settle them quite happily, part of that was definitely to do with being inside. I probably have to work up to a hack or working in their outdoor school. This weekend I will be riding twice and I can’t wait, it felt like an age since I rode when I got on Quasar and that was only just over a week! This is fab to hear! I hope you do get to spend some more time riding him. Riding school horses tend to be a bit ‘blunted’ (for wont of a better way of putting it), merely by virtue of having had so many clueless novices sat on them giving them contradictory messages without realising it, so I would imagine a horse who’s much more responsive due to being more switched on would be a great confidence giver!